A house in De Beauvoir Town with a rooftop garden pyramid is in the running for House of the Year 2016. The Garden House has been included on the Royal Institute of British Architects (RIBA) longlist for House of the Year. Architects Hayhurst and Co were asked to create a house that would function as both home and studio, maximising space and natural light. They found innovative ways to fulfil that brief, prioritising light by installing a mirror-polished stainless steel-clad roof light, which floods the entrance with brightness, as well as strategically placed roof lights on the ground floor. 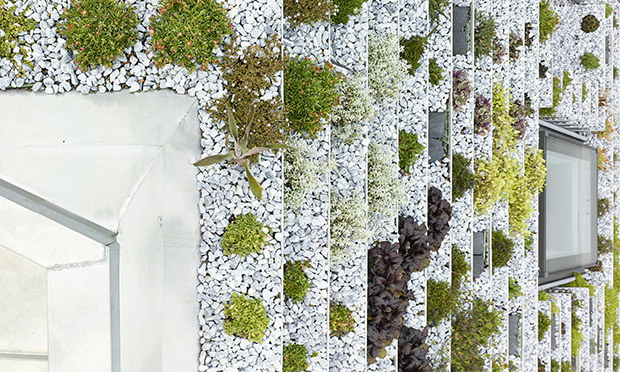 But the stand-out feature of the Garden House, which is nestled behind Victorian terraced housing in the De Beauvoir Conservation area, is a bespoke hanging garden, formed by refined, lapped stainless steel trays. Sedums and heathers are planted into stepped flower beds, apparently meant to replicate flora in the town of Dungeness. As well as being nominated for House of the Year, where it will face stiff competition from a Clapham residence covered in mirrors, the Garden House won a RIBA regional Award. According to RIBA, the jury was captivated by the house’s “exquisite detailing”. “It gives the owners a peaceful and private space to live and work, which is impressive considering the enclosed nature of the site,” the jury noted.